The chinar tree has long been tied with holiness and is especially respected in Kashmir for its prevalence and vivid history. 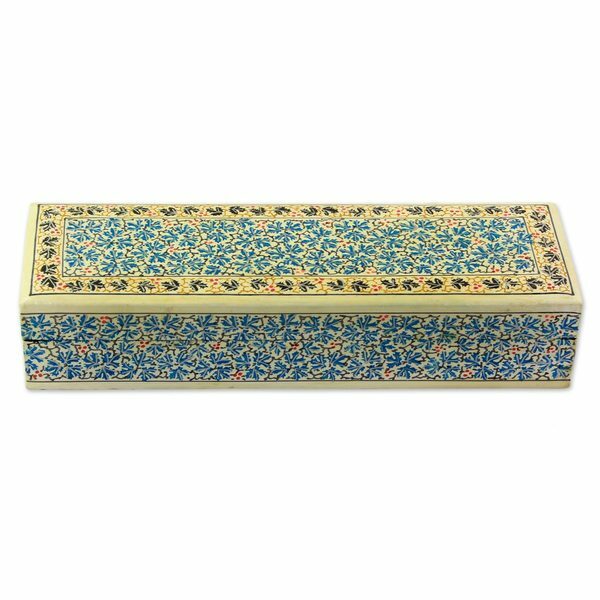 Indian artisan Sajad covers this beautiful box with papier-mache and then adorns it with chinar leaves on all sides using creamy and vibrant oil paints. The inside is a beautiful black that provides a stunning contrast to the lively outer decoration. Hello, my name is Syed Sajad Hussain born on 18th March 1960 in the mesmerizing town of Srinagar in Kashmir. I have inherited this rich crafts from my ancestors who have been involved in the profession of creating exquisite handicrafts for a long time. Ever since I extended my hand in executing the rich craft, I have been always keen about one thing and that is quality. I have about 50 workers assisting me in achieving my goal. My lines of products are chain stitch rugs, shawls, pashmina, hand painted papier machie, table linens, bedspreads etc. I think a lot of things involved in making your product worth its appreciation. The most important being quality. Besides, color combination also count a lot. I put a lot of efforts in blending colors to create the most unique articles. This is the plus point of my products. Though modern style remains the mass appeal, traditional style is undying and would always be as appealing as it was 100 years ago. Novica is a great platform to give exposure to artisans. A platform through which all art lovers can appreciate and own some traditional unique products from around the world. And I am sure this relationship with Novica would surely open up new avenues.